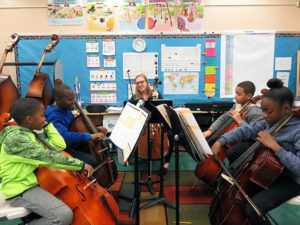 NYC nonprofit Education Through Music (ETM) has been chosen as one of 14 nonprofit organizations by financial services firm Morgan Stanley for their 10th annual Strategy Challenge. Since 2009, Morgan Stanley employees have committed over 81,000 service hours, providing tailored recommendations to 117 nonprofits to help support organizational goals. The Morgan Stanley Strategy Challenge will provide 10 weeks of pro bono consulting to ETM. This project will focus on exploring and analyzing models for national expansion of the Education Through Music model. Education Through Music was founded in 1991 to promote the integration of music into the curricula of disadvantaged schools in order to enhance students’ academic performance and general development. ETM forms long-term partnerships with at-risk elementary and middle schools to develop sustainable, long-term music programs. The ETM model currently serves nearly 30,000 students in inner-city schools in New York City, and our model reaches another 12,000 children through the work of our licensed affiliate organization in Los Angeles. ETM’s comprehensive, sustainable music education network has garnered the support of corporations, public policy makers and foundations, including The Music Man Foundation, CMA Foundation, The Jerome L. Greene Foundation, Steinway & Sons, William Randolph Hearst Foundation and D’Addario Foundation. For more information visit ETMonline.org.